Also found are the Blue Velvet Monkeys and the Ader's Duiker. It is said leopards, small in shape, live in Jozani Forest, though it is unlikely that you will see them. With a population of over 40 species of birds you cannot find a better bird watching place in the island. The Jozani Forest area also hosts a breeding station for Sea Turtles and there also live specimens of Leopard Turtoises as well as Giant Turtoises, the same species that are living on Prison Island. The small sea turtles are saved from perishing at the seashore, and they are nursed in the centre until they are big enough to be released back into the sea. Visitors will be informed by the park rangers and they are also allowed to feed the animals. Jozani Forest lies about 35 km South-East of Zanzibar Town. The area consists of evergreen bushland, thicket, different forest types and mangrove area. One of the most famous residents of the Jozani Chwaka Bay National Park is the Red Colobus Monkey. Found only on the main island of Zanzibar, the Red Colobus is recognized as a separate species and is said to be endemic here. 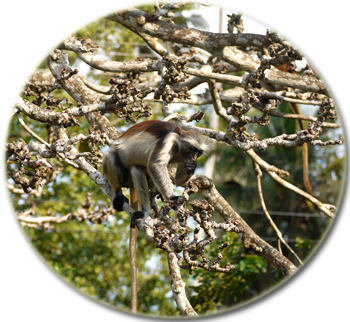 A visit to Zanzibar is not complete without seeing one of the rarest monkeys in Africa, with less than 2000 remaining in the world. A trip to Jozani Forest can easily be combined with a visit to the Zala Park, where you can see various snakes occurring in Zanzibar and also with the nearby Butterfly Center.